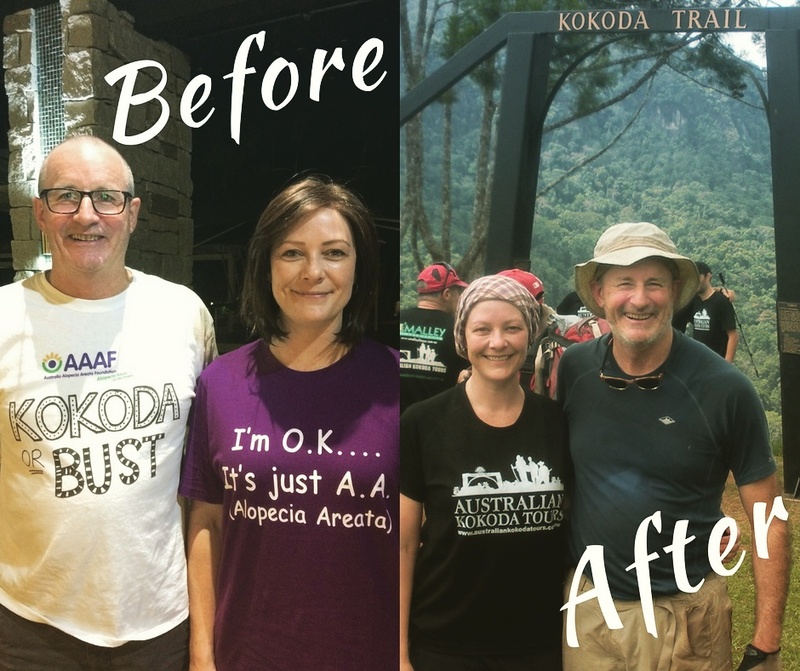 “I can honestly say it was the most challenging thing I have ever done both physically and mentally and certainly one of my most rewarding experiences. For me, carrying my own pack for all of the 98 km was a personal achievement and I was the oldest trekker of our group to do this. It wasn’t easy, but I achieved what I set out to do. The whole campaign was very successful in creating awareness about Alopecia Areata as well as raising funds for us to continue our important work. We were able to get exposure in local and national media which gave us reach beyond what we are normally able to achieve. From a personal point of view, the journey provided a great appreciation of the sacrifices of the Australian soldiers who battled against the odds to finally prevail against the Japanese Imperial Army. The battled sickness, hunger, a better equipped and larger enemy force. The four values demonstrated so beautifully by the four pillars at Isurava War Memorial were so evident in the battles – Courage, Endurance, Mateship and Sacrifice – values we can all take up in life to make us better people. An enduring memory for me is the remarkable people of PNG particularly from the villages we encountered. These people are the descendants of the “fuzzy wuzzy angels” that were so vital in helping the Australian cause during the war – carrying stretchers and supplies and providing intelligence vital to the war effort. The term “fuzzy wuzzies” is accepted with great pride and it was a personal highlight to meet one of the few surviving FWA’s from the war in Kagi village and the beautiful children there who welcomed us with a song and a garland of flowers for each of us. These are a beautiful people, living a simple life with great dignity and the joy of life. A highlight for us was the morning “haka” to get us motivated for the day and also the beautiful singing of the village children and the porters. Our third trekker, Andy, became ill prior to departure and has rescheduled his trek for early next year.